The computing power available in modern mobile tech is vastly superior to what was available several years ago. However, speed and functionality aren’t the only factors that require attention when creating new devices for use in the field; durability and the ability to continue functioning in less than ideal conditions is also crucial. The inability of past mobile devices to remain functional in extreme temperatures has always been a challenge. Being able to maintain functionality in a demanding environment means that new advances must be made to tech in order for it to withstand the demands made by current conditions in the field. Crews working in below freezing temperatures, snow, sleet, or freezing rain, often find digital tech to fail once a certain threshold was reached. They face obstacles like glass and plastic cracking, chargers failing to work, and dampness seeping in to cause corrosion or shorting out connections, forcing them back to outdated methods like clipboard and pen to record data and inventory. Crews working in tropical climates, such as jungle or desert terrain, also face challenges with devices overheating, moisture from humidity or sweat getting into the works, and glare making the screen all but unreadable. The device heats up past the ability of internal cooling systems to combat, and shuts down. Again, paperwork reverts to being actually on paper, costing extra time and adding to frustration. Many existing tablets tested in extreme conditions fail to meet requirements. Normal casings, insulation materials, screens and chargers simply won’t stand up to temperatures below freezing or over 110 degrees – they simply aren’t durable enough. A few days in the field and they turn into unusable bricks, unable to keep up with the demands of the environment in which they are being used. Since electronic failure in the field inevitably results when devices are pushed past their limits, the repercussions are many. Crews lose the ability to communicate in real time, data is lost and must be collected again, and mistakes multiple as the ability to accurately capture and store information falls by the wayside. A Rugged Tablet is designed to stand up to extreme field conditions – it keeps on working so the crew can keep working at optimal efficiency. This leads to less trips back and forth, less demand for varying forms of data collection, and a seamless mode of work that can be sustained indefinitely. Built in strength and stability join with the latest in computing to create a device that will work anywhere, anytime. When it comes to technology, modern day advances move so quickly that technical-knowledge gaps become glaringly apparent. The rapid shift into mobile computing over the past decade leaves some less-technical personnel behind the curve, while gadget-hungry minds latch on eagerly to the latest in mobile tech. One member of the team may feel comfortable with a desk-bound computer, preferring clipboard and pen when out of the office, and rarely even using their smartphone. While another team member is fully digital, and becomes impatient with the other’s need to return to headquarters to complete painstaking data entry. How do the two needs find common ground? A rugged tablet can bridge the divide with features that will feel familiar to those used to desktop computing, but with all the current mobile technology benefits. The rugged tablet is portable, unlike a PC; easy to use on the move, unlike a laptop; and has more capability than a smartphone for full functionality in the field. With a rugged tablet, the majority of the tasks that can be done on a PC or phone can be accomplished – and more. From quick, easy scanning and data entry on site to the ability to implement GPS coordinates and real time communications with other units, the tablet is the ideal in-the-field device. A rugged tablet can be the perfect device to break through the barrier for those less familiar with the latest technology. Common reasons for resisting a shift to new technology include anxiety over the unfamiliarity of the device, the misperception that smaller and more portable tech is innately more fragile, fear over damaging expensive devices, and clumsiness when it comes to smaller keyboards and touch screen functionality. Those early-adapters of gadgets expect the functionality and portability of the mobile tech, embracing the smaller screen size, the touch screen, and the speed of high end processors. They expect their gear to be tough, and don’t carry anxiety over damaging it. The rugged tablet provides adaptable features to make it more appealing to both demographics, with a snap on, snap off keyboard for those who find touch screen typing clumsy and slow, a drawing or writing stylus for former clipboard users to take fast notes, and the durability to take abuse in the field as well as a topple off of a desktop corner. 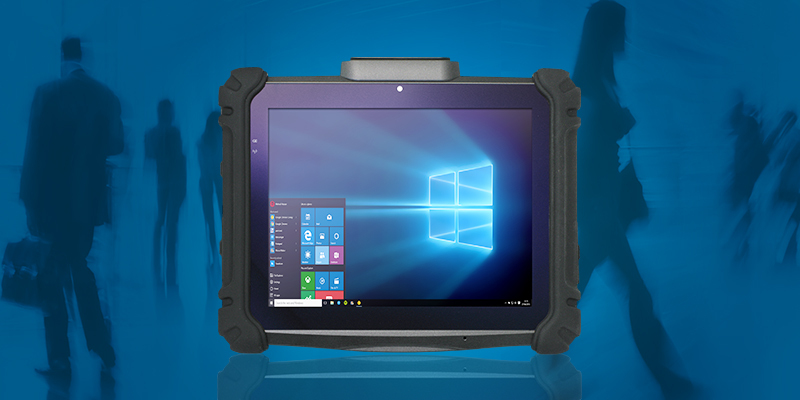 Overall, the rugged tablet is the ideal device to bring all members of the team together on common ground, enhancing their ability to work together with newer technology, and providing an adaptable, customizable experience that meets each individual at their own level of comfort and familiarity. Rugged tablets allow all to work smoothly together on a device that is adaptable and takes into account their knowledge and familiarity with a variety of functions and features; it’s the perfect “bridge” device. Rugged tablets are skyrocketing in demand as various industries realize their value and get on board with superior hardware to go with ever evolving software. The rugged tablet isn’t just an oversized smartphone that comes with a fancy case; it’s a ground-up, technologically advanced purpose-built tablet that combines function and security into a highly mobile, multi-use device. Mobility. With a rugged tablet you are untethered from the desk and office, able to take your data with you in the field or on the road. Security. With features like built in card readers and multi-step authentication software, each device allows access only to authorized personnel, and can differentiate between levels of clearance. High Performance Processing. Each tablet is equipped with a high performance processor, whether it’s an Intel dual or quad-core processor or above. Screen Size. Whether you need a compact 7 inch tablet or a large 13.3 inch screen, we have the rugged tablet for you. Sunlight Readability. When moving in and out of doors, a non-glare screen can keep your tablet screen readable. Capacitive Touch Screens. Use a fingertip or stylus for maximum portability. Rugged tablets are designed to pick up on touch movement even in cold or hot conditions. Temperature Resistance. Whether triple digits in the desert or below 20 degrees, a rugged tablet can keep going without freezing up or over-heating. 3G / 4G Connection Modules. Access your data network on the go, with an ever widening range of mobility. Wi-Fi / Bluetooth Functionality. Tap into the closed network on the job and enjoy hands free operation to improve productivity and enable better logistics. Compatible Operating Systems. Seamlessly integrate with existing systems and share, transmit, store, and view data in familiar frameworks. 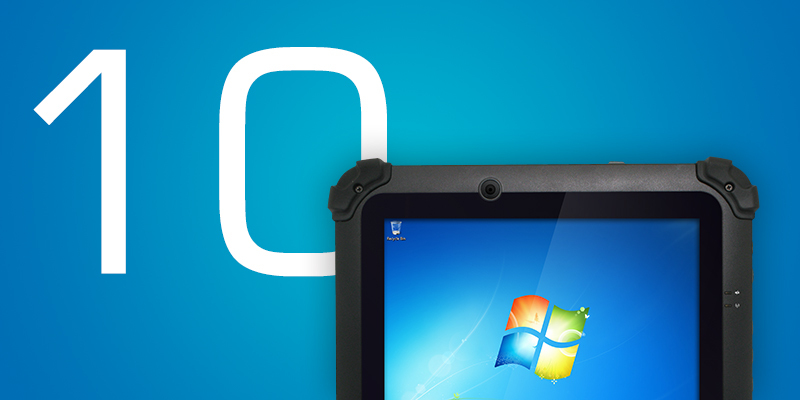 Besides the benefits listed above, rugged tablets can be customized to meet nearly any requirement. A camera, a smart card reader, an RFID chip, a barcode scanner or other data capture module, and charging cradles, keyboards, and multiple or split screen functionality are all options. The rugged tablet is the device of the future, so don’t get left behind – enjoy all the advantages of a mobile device with all of the benefits of a PC with rugged tablets designed for functionality, mobility, and strength. When device failure happens, the time spent to fix or replace the device can eat into productivity margins and derail the workflow. Rugged tablets restore productivity by significantly reducing the rate of failure, simply through making the device in question much more impervious to damage. There are various verticals in which issuing rugged tablets to staff, employees, contractors or other personnel makes sense. The time saved will increase productivity in these four specific verticals, making the choice to switch to rugged tablets from other mobile devices the obvious one. Exposure to harsh working conditions and the need for a device that can handle inclement weather as well as sand, dirt, mud and grit is paramount. The rugged tablet keeps going even when lesser devices succumb to heat or cold, making it easy to access sensitive data on the move. Productivity stays strong when devices don’t have to be replaced. 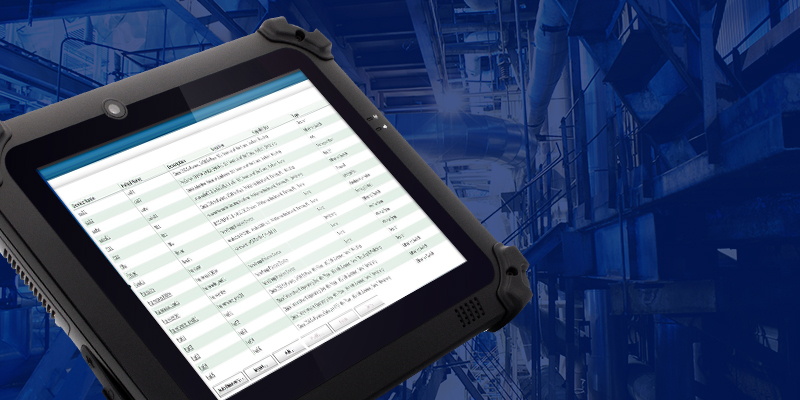 A rugged tablet can survive being dropped, knocked off of a shelf, passed from hand to hand throughout the day and even exposed to chemical fumes or high or low temperatures. A tablet that can survive a drop and keep scanning and storing data can be invaluable in maintaining productivity. For employees always on the go, a rugged tablet is the best way to stay connected and not have to worry about the device getting jostled, dropped off a truck, or spilled out of a carryon. The ability to stand up to miles of travel and being taken into every conceivable location makes a rugged tablet the smart choice for both mobility and strength, and raises productivity by replacing all other devices. On the job or work site, rugged tablets enhance productivity and prevent snags – when all of the pertinent information, including surveys and blueprints, is in the device, there’s no running back and forth to retrieve specs or frustration over missing pans or warning flags. 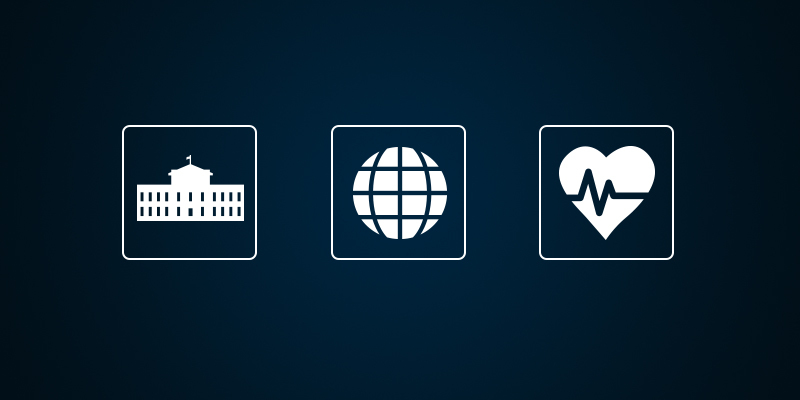 There are other industries where rugged tablets can also shine, including healthcare, hospitality, and retail. Any scenario in which device failure can throw a wrench in the day’s plans can benefit from the productivity increase a rugged tablet can provide.